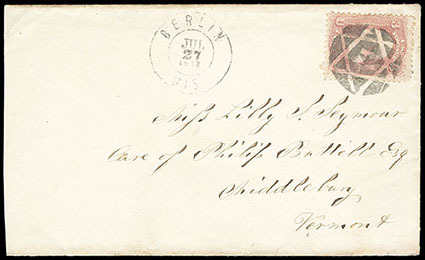 Bottle Stopper "4" with Negative Six Point Star, choice strike ties 3¢ rose (65), matching "Berlin Wis, Jul 27, 1863" cds on cover to Middlebury, Vt.; reduced slightly at left, Very Fine and remarkable cancel, ex-Beane. Skinner-Eno No. NS-D unlisted Estimate $300 - 400. Kicking Mule, black strikes each cancel 8¢ Columbian (236) and tie 1¢ green (279) vertical pair on 2¢ pink (U370) blue entire to Capt. 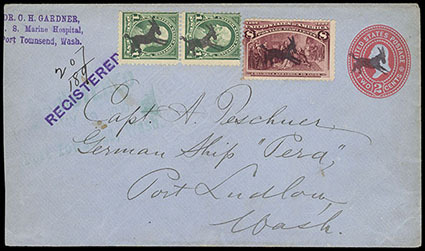 A. Peschuer, German Ship 'Pera', Port Ludlow, Wash., slightly indistinct blue-green "Registered / May 19 1900 / Port Townsend, Wash." three-line registry postmark, purple Dr. C.H. Gardner, U.S. Marine Hospital, Port Townsend Wash. corner card handstamp and matching "Registered" straightline; reduced at left, otherwise Very Fine and scarce registered kicking mule use. Cole No. AN-11 Estimate $500 - 750. 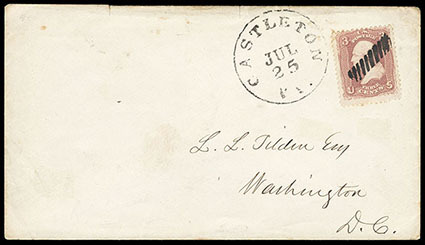 Rope, full bold strike cancelling 1861, 3¢ brownish red on cover to Washington D.C., with matching "Castleton, Vt. Jul 25" cds alongside; few small cover tear at top, Very Fine, a choice strike of this elusive fancy cancel. Scott No. 65. Skinner-Eno No. SD-G 92 Estimate $200 - 300. 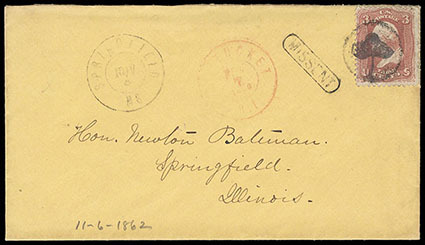 Tree in Circle, complete strike tying 1861, 3¢ rose on cover to Springfield, Ill., matching "Springfield, Ms. Nov 6" origin cds, missent with red Pawtucket, R.I. forwarding cds and "Missent" handstamp; stamp with small flaws and missing most of backflap, otherwise Very Fine, unlisted in Skinner-Eno and quite possibly unique; with 2018 P.F. certificate. 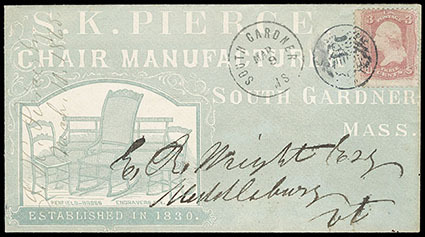 Two Cent Coin, strong clear strike of fancy handstamp duplexed with "South Gardner, Ms, Mar 9" cds tying 1861, 3¢ rose on cover to Middlebury, Vt., with bluish green allover illustrated "S.K. 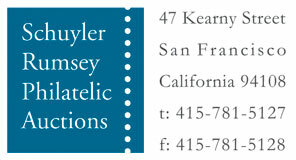 Pierce, Chair Manufacturer" ad design, Very Fine and choice, a wonderful fancy coin cancel and ad cover combination. Scott No. 65. Skinner-Eno No. PO-Co 3 Estimate $600 - 800. 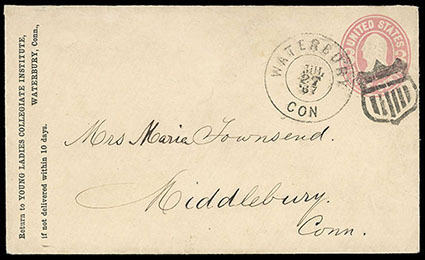 (Waterbury, Ct.) 6-Bar Shield, perfect bold strike duplexed with full "Waterbury Con, Jul 27 '67" double-circle datestamp on 3¢ pink (U59) buff entire to Middlebury Conn.; repaired tear, choice and Extremely Fine appearance. Rohloff No. Q-10 Estimate $1,500 - 2,000. A GEM STRIKE OF THIS RARE WATERBURY 6-BAR SHIELD FANCY CANCEL.